Public School 90 (a.k.a. 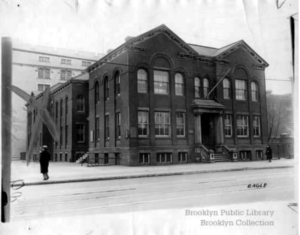 the Flatbush School) as it looked in the 1920s. Piper had always gotten good grades in vocabulary, but she had no idea what “thaumaturgy” meant. She continued to study the notice as she blindly followed the other students into the hallway. The detention was scheduled for the next day. But she wanted to speak with the person who had issued the notice so she could explain to her aunt and uncle exactly what it was that she had done wrong. The numbers on the classroom doors ascended as Piper made her way down the hall. She stopped when she reached Room 117. It was the principal’s office, which was no surprise to Piper. Principal Kaiser probably wanted to discipline her for flicking Sal on the noggin. 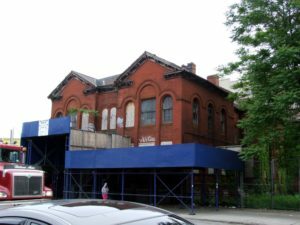 The Flatbush School at 2274 Church Avenue, on the corner of Bedford Avenue in Brooklyn, as it looked in 2016 before it was demolished for public safety reasons. Mr. McFadden grasped his broom handle again. “So let that be your first lesson in your new school, lassie—don’t be playin’ in locked rooms,” he growled, pushing a growing pile of dust across Piper’s path that almost soiled her new shoes. Tagged #cloakroom, #ConeyIsland, #CustodialWorkersRecognitionDay, #detention, #thaumaturgy, 1920s. « Domino’s “Paving for Pizza” is an engaging campaign for all audiences. But where’s the Noid?